Epiphany #1: You know that vent cover? The one that is on the floor right next to the toilet in the bathroom, and has been present through three rounds of little-boy potty training? The one that is rusted from all the overflowing bathwater and such. Guess what? You don't have to keep that one for the next 20 years. They sell new ones at the store for like five bucks! Epiphany #2:You know how you've been using mason jars as cups for the last two years because your drinking glasses all got broken? Guess what? They sell drinking glasses at the store too! I hired Rosie this week. No really, the lady I hired is named Rosie. I decided there are three things that I really wish I was accomplishing: Exercising, spending time with my family, and keeping my house clean. As much as I'd like to hire someone to exercise for me, cleaning seemed like a more viable option. It was this post from Wonder Woman Wannabe that pushed me over the edge. Thanks for the enabling, Heidi. I used this website http://deanjackson.dj/nameanagram/ to find out what my best name anagram is, because apparently I have too much time on my hands. The best they could come up with for me was "I'm a Hackeries Knob" What does that even mean? I've spent a year growing out my bangs. For some reason, last weekend when I was sitting in the hairstylist's chair I suddenly blurted out "Let's try bangs again!" Guess what? They look exactly the same as they did 12 months ago. Somebody slap me. I never update the software on my computer. If a screen pops up and there is a "remind me later" option, I will press that button every. single. time. Epiphany #3: When driving in the dark to a destination in the "big city," double check the address you put in your GPS. Yes, one number DOES make a difference in navigation. Like a 10 mile difference. I called my husband from the scary neighborhood in the boon tillies, and he says "Seriously? I don't think you should be allowed to go anywhere alone ever again." Amen to that. Okay, kids, what's on your mind this week? 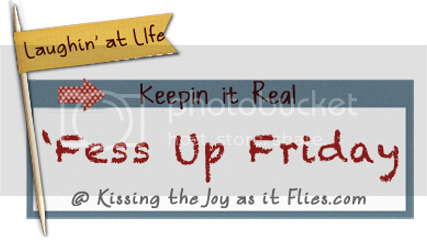 You can grab a 'Fess Up Friday button here if you want to play along. Last week Amanda Jo 'fessed up and her post cracked me up. Funny, funny girl. Man, I wish I could hire a Rosie! I think it'd be AWESOME!!!! I tried that website you listed mine was Jam An Ado - totally clueless on what that's supposed to be. P.S. My anagram name is Man-Like Amasser. Really??? With my middle name, it's "I'm an Alarm Sneakiness." I guess anything is better than being called man-like when you're not, like, a man. you got a rosie!!? yay for you! love the cartoon - adorable. you do NOT want to know what it is with just my middle initial rather than my entire middle name....eeeeek!! !